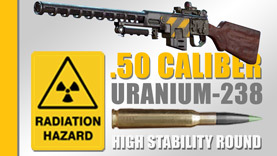 U-238 & U-239 are both way too hard to get, too rare, to be used as ammunition. Also a .50 BMG is too large to be used as platform to *ahem* waste U-238 & U-239. It would be like running a very expensive uranium enrichment plant for years only to get a few bullets. It would glow blue probably and kill anyone that was near it. Also a sub-critical mass, so it wouldn't blow up, it would just be super expensive metal that someone wasted, that also killed them. U-235 is more common and the large amount of natural decay of uranium into various other elements & metallurgic types though mixed into an alloy with various other metals probably. Take iron, put carbon it it, it's steel, put tin in that, and it's now aluminum. Brass with tin inside it makes copper I think, you know, whatever it is, the "rules" of how these compounds interact. Tungsten, magnesium, copper jacket, and lead ect. 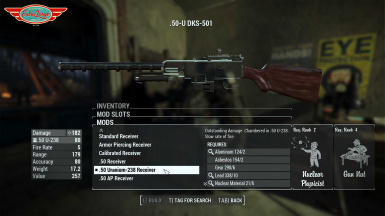 DKS-501 is a .308 SA platform, it's all based on firing high velocity (faster than speed of sound) .30 caliber rounds in various forms, .30 in year 1906, 7.62mm military, civilian .308 even, it's all 30 cal, you can use math, one is .308 & the other is .50 It's almost twice the size, and also much longer, 2-3 times longer. So hopefully you also see the flaw in this design of receiver & barrel for a .50 ball, .50 AE (Acton Express), or .50 BMG (Browning Machine Gun). Sabot come to mind, but there we are only applying a fuel or explosive charge in order to break thick armor with a pin hole & subsequent fire charge. Not applicable I'd guess, but the design could be used to deliver fire or radiation damage, chemical, ect. We're still about half short on a human sized canon that would be needed to fire it, LOL. Even still there are incendiary rounds that would do a better job I'd think. Anything strong/hard for metal would shatter at these high velocity x high mass, which if we think about it is just a energy dispersal amount. Making a fancy one seems superfluous. Specially for a Mah Duce suppression anti armor large caliber machine gun playing off a high mass high velocity pressure wave & much larger range ballistic chart. Though you would get 8 rounds per bottle cap so not completely silly as we might think. Lead surrounded by a copper jacket (meaning brass with tin in it) the lead part absorbs the impact, instead of shattering, it deforms. The copper part, is harder than brass, which keeps the projectile together instead of it shattering, because it's still going to shatter, the goal was to get some amount of penetration. To increase damage the design is changed to allow for expansion, ergo a fictional sabot hollow point. 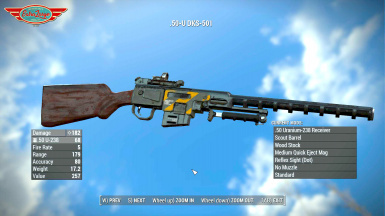 Still though, limited to .30 caliber, because the receiver & barrel would literally explode with the gunpowder charge with larger rounds, unless a heavy receiver & barrel were made, though that wouldn't be DKS-501 anymore, it would be something else, like a anti material rifle (why it doesn't or shouldn't exist in DKS-501 trim) Though I understand we were encouraged to think this "Hollywood fictional entertainment" sort of way. Still though, one is limited to sub-copper & lead metallurgy strength/hardness to avoid physics conditions that result in a shattered projectile at impact (therefore useless) & financial limitations as well because it would need to be supplied with ammunition. Uranium in any form is on the other end of that table of elemental metals in both hardness and cost. We are welcome to try a inertial created fission critical mass event though. While I appreciate your dedication to physics and subsequently realism, I cannot imagine how you manage to play a game like Fallout 4 without having an aneurysm. It's actually U-238 and U-239 by Fallout's universe standards. These are more than likely a completely different type than the types found in our universe. They act different. Just named the same. It's also cheaper in-game. U-235? In the Fallout Universe? Are you insane? THAT is how you kill way to many people. U-235 in FA is ridiculously overpowered. It was deemed unusable. As for the DKS being a .308 platform, you're right. But an AR-15 is a 5.56 platform... but can be converted to 7.62 or even .22. With a simple conversion kit or a re-modeled DKS barrel and receiver (depending), it could indeed chamber the 12.7mm .50bmg (witch is less than 1/3 bigger), the 7.62, the 5mm, 10mm, even the 20mm. Even mini-nukes. The gun would look longer/bigger in real life, but it works fine in game. Also Sabot? Googled that and got a wooden shoe. If a Sabot is common knowledge, I missed something in highschool. If this was about how the DKS can't chamber wooden slippers, your right, that's nonsense even for a video game. Also hilarious, lets try it. Finally, the rest is mostly about how the bullets won't work right? Well, thats because the bullets in Fallout arren't made of the same stuff in the Real World. Sure, they're referred to as "Lead" or "Steel Tipped", etc, but they use a highly advanced, cheep, chemically sound metal alloy mixtures called "Bullshitium Carbide". Similar to all those fictional metals from every Marvel / DC universe thats just better in every way, only real. In Fallout. Witch is a game. Where Molecules are Pixels. Logic is Code. And your analysis is futile, and mine is more accurate. Not 100% true, but way harder to disprove using Fallout logic. You are right though... if Fallout was our world. But it's not. It's Fallout. Witch we're playing because it has things that the real world doesn't. Thus, putting Fallout under the Real-World Logic Microscope completely and utterly defeats the purpose of playing the game in the first place. Go to College or University, become a Scientist. Trust me, you'll excel there. But not here. First of all I would like to thank the creator for the good idea. 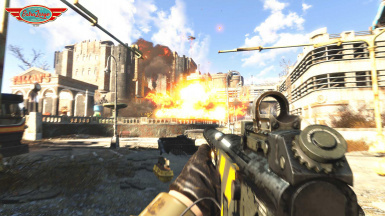 The explosion is stronger than a Fat Man, the radiation takes you 40 points per second at the blast site (madness), it kills you in 5 seconds if you approach with a powerful armor. Completely unfeasible this mod. The 'graphics effect' and damage should be like 'explosive weapon effects' (a small local blast) scoring at maximum 400 damage, knowing that Fat Man's deals 1500 damage per warhead (with all mods that increase damage). 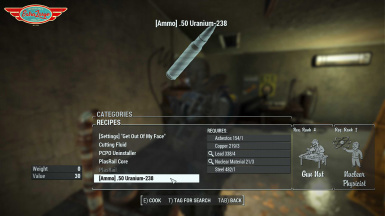 This mod should make reference to 'tungsten bullets' and depleted Uranium (Uranium-238), only. This equipment can not do such devastation. In that sense this weapon is completely out of the reality, including of the universe of the game, a small ammunition can not have so much power. And you can not go from Fat Man to Fallout, that's counterproductive. Can this spawn on NPC's or as a Legendary weapon? Can you make an option to increase blast damage from 500 to about 2000 hp? Now take your DKS to a workbench, go down to "Legendary" in the modification menu, and pick any mod that boosts damage. Some are small boosts, big boosts, insta-kill, nukes, fire, cryo, plasma, idk. there's a lot. Have fun. Yeah, I already nerfed it, just have to polish a few things before I can upload the update. can you make a version without an explosion radius? 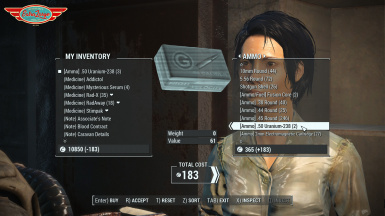 You can easily modify the explosion Radius with GECK or i can make one after i get permission from the author of this mod. An explosion without an explosion radius, what does it mean?? I think Sycoe means they don't want the rounds to explode. Then they can use normal rounds, I guess. So just a more powerful round. That's easy. Will add a bunch of new ammo types for the next update. Hi. Sorry, was busy with work. I'll be posting a new version for my other mod 1st and then I'll check your files and start working on this one. I have 0 experience in 3D modelling and I presume I would need to make a new model for the new receiver (even if just a copy of the existing .nif file) to assign a custom texture to it. That's what holding me back atm. So many ideas and no means of making them happen.